According to Egyptian records, the Philistines did not arrive in Canaan along the Mediterranean coast until the 13th century. The biblical record according to Genesis places the Philistines in Canaan several hundred years earlier; thus, critics cite this as an anthropologic anachronism that supports the late dating of the Documentary Hypothesis. In general, the archeological data does indicate that there was a mass migration of Philistines and other tribal groups to the coast of Canaan during the 13th and 12th centuries BC. The Philistine presence in Canaan during the 21st and 20th centuries BC has not been confirmed or denied by archeological data yet. Approximately 1225 – 1175 BC, the Egyptians record that "foreigners from the sea" from the "northern countries" or "their islands" beyond the sea (the Mediterranean), attempted to invade Egypt. These foreigners, whom contemporary scholars call "Sea Peoples," originated from areas around Greece and Turkey. 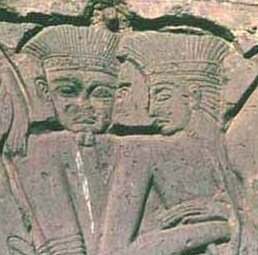 Danuna (known as Denyen, Danunites, Danaoi, Danaus, Danaids, Dene, Danai, and Dannaian) have been recorded in the El-Amarna letters dated about 1350 BC. Karkisa are, because of their sparse mention in ancient records, considered one of the minor tribes, and scholars are unsure if the term refers to a tribal group or geographical region. Labu (known as Labu, Libu, or Rebu) is the tribe from which the land of Libya based its name. Lukka, mentioned in early Hittite texts, were known as pirates for their seagoing and rebellious ways. Ancient texts attest to their presence as early as 1450 BC when they were defeated, as part of the Assuwan Confederacy of 22 other tribal groups, by the Hittites. Meshwesh have been mentioned in several ancient texts and reliefs in their attacks on the Egyptians. They have been documented to ally with other tribal groups such as Tehenu, Temehu, Labu, Philistines, and Tjekker. Shardana were first mentioned in the El-Amarna letters dated about 1350 BC in the service of an Egyptian mayor as part of a military garrison. Shekelesh, like the Karkisa, were rarely mentioned in ancient texts; however, unlike the Karkisa, they were noted for their fierce fighting capabilities during their attacks on Egypt around 1220 BC and 1190 BC. Tjakkar, along with the Philistines, were a major tribal group that attacked Egypt in 1190 BC. They were depicted prominently in the reliefs at Medinet Habu, the mortuary temple of Ramses III. Philistines (also known as Pulsesati or Peleset) migrated as a tribal group and in their resettlement after the Egyptian conflicts became the dominant group representing the Sea Peoples in Canaan. They possessed iron-working skills, were proficient in the ceramic arts and the manufacture of textiles, and founded several large, complex cities. 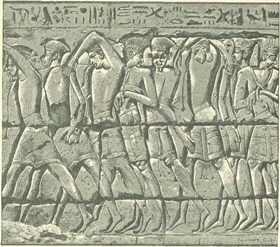 Part of the reliefs indicates that the Philistines were in Canaan before Ramesses defeated them. Egyptian records also indicate that Ramesses III forced the defeated Sea Peoples to settle in Canaanite cities, outside of Egypt, and formed Egypt's outer line of defense. The Onomasticon Amenope, a collection of manuscripts dating to the end of Ramesses IX’s reign at the end of the 12th century BC, lists the Sherden, Tjekker, and Philistines as living within Canaan. The Philistine cities Ashkelon, Ashdod, and Gaza are mentioned as cities comprising Egypt's outer defense line. These three cities along with Gath and Ekron formed the 5 Philistine city-states mentioned in the Bible (Josh 13:2-3; 1 Sam 6:16-18). The Philistines were perhaps at the greatest height of their power around 1150-1000 BC and threatened southern Israel from the time of the judge Jephtah through the time of the prophet Samuel. It wasn’t until the victories of David when the influence of the Philistines finally waned about 1055-975 BC. Current archeological findings regarding Philistines continue to corroborate with the later biblical accounts of Judges and 1 and 2 Kings. While the Egyptians record the Philistines as a tribe of a group who invaded Egypt and settled on the coastal plain south of Mount Carmel, the Old Testament used the term to describe all the people who were living on the coastal plain at the time of the Conquest and the succeeding period of the Judges. The debate of anachronism centers on the Genesis record of Philistines during the time of the Patriarchs somewhere around the end of the third millennium BC (2100-2000 BC). In this alleged anachronism, there are some unusual aspects to it. The textual information in Genesis portrays Philistines as being friendly to Abraham and living in one city with a king. In contrast, the Philistines of later Hebrew history (Judges) were virulent enemies, as exemplified by the giant Goliath, and lived in 5 city-states led by lords. Critics, who believe that the Philistines in Genesis were a textual update or redaction by a later editor, face the contradiction of Philistine attitudes towards the Hebrews and differences in political leadership: why would a feared contemporary enemy be portrayed as a friend in the Genesis accounts? Currently while there aren’t any extrabiblical accounts that confirm (or deny) the Genesis account, there is circumstantial evidence that the account is historical. The earliest mention of the Philistines occurs in Genesis 10 with its presentation of the Table of Nations. Initially the Philistines are identified with Casluhim; however, later verses in the Old Testament indicate that the Philistines were associated with an area called Capthor. The location of Caphtor has been narrowed down to three areas: the island of Crete, Cyprus, or southwest Asia Minor. Most scholars believe that the location of Caphtor is the island of Crete. During the first half of the second millennium BC, Crete controlled much of the Aegean and western Anatolia. During the later half of the second millennium BC, the Mycenaean Greeks of Greece controlled Crete until the 13th century BC. During this time there was extensive trade with the entire eastern Mediterranean including the coast south of Mount Carmel, which became known as Philistia. Extrabiblical sources also seem to equate Caphtor with Crete. Egyptian records of the Late Bronze Age mention Crete as "Kftyw", which can also be translated as "Caphtor." The ancient name of the Philistine city of Gaza was Minoah, which was the same name given to several trade stations that originated from Crete. Closer examination of the Medinet Habu reliefs provide additional information that associates the Philistines with the Aegean and Mycenaean world including west and southwest Anatolia. Clothes – Philistine warriors are portrayed wearing feathered headdresses, which are very similar to those pictured on the Phaistos Disk, a clay disk found on Crete with inscribed symbols (of humans, animals, and plants) and words. It is dated around 1700-1600 BC and possibly was imported from southwest Anatolia. According to the Greek historian Herodotus (440 BC), the feathered headdress worn by warriors from southwest Anatolia, were later adopted by Greek warriors. Transportation – The ships transporting the Sea Peoples, pictured at Medinet Habu, resemble the ships on the Phaistos Disk and a Mycenaean Greek vase found on Skyros, an island in the Aegean. In another example, the Medinet Habu portrays the chariots of the Sea Peoples containing three men with spears, which is similar to Hittite / Anatolian warfare methods. In contrast, Egyptians use their chariots to transport 2 men with bows. 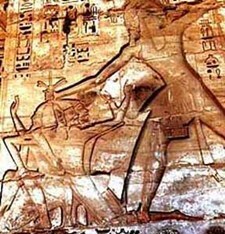 Lastly, the Medinet Habu pictures the Sea Peoples using wagons and humped oxens, which is clearly an Anatolian custom. Artifacts of Aegean origin, dated about 1900-1700 BC, have been found at Ras Sharma, Hazor, and Megiddo indicating that there once existed a thriving Aegean trade. The real ethnic identity of the Philistines is not well understood. Biblical and extrabiblical references generally use the term to represent several clans from southwest Asia Minor. While the archeological evidence has not confirmed or denied the biblical accounts of the third millennium BC Philistine, archeological findings dated in the latter half of the second millennium BC indicates that the Philistines were from an area that was well known for their sea faring skills, warrior capabilities, and far off trade. Thus, the Philistine reference in Genesis could very likely refer to historical people that existed at that time and not represent an anachronism that critics propose. Furthermore it is also very likely that the Philistines of the 21st and 20th centuries BC (Genesis) are the same people as the Philistines 13th and 12th centuries BC (Judges and Kings) but migrated to Canaan at different times. 1. Barnett RD, "The Sea Peoples" in The Cambridge Ancient History, vol. II, part 2, Bury JB, Cook SA, Adcock FE, ed. Cambridge University Press (1975), p.362-366. 2. Bierling N, Philistines: Giving Goliath His Due, Baker Book House (1992). 3. Drews R, The End of the Bronze Age: Changes in Warfare and the Catastrophe ca. 1200 B. C., Princeton: Princeton University Press (1995). 4. Gardiner, AH, Ancient Egyptian Onomastica, London: Oxford University Press (1968). 5. Moran WL, The Amarna Letters, Baltimore: The Johns Hopkins University Press (1992). 6. Pritchard J, Ancient Near Eastern Texts, New Jersey: Princeton Univeristy Press (1969). 7. Redford DB, Egypt, Canaan and Israel in Ancient Times, Princeton: Princeton University Press (1992). 8. Sarna N, Genesis, New York: Jewish Publication Society (1989), p.252.